Online retailer Buydig is offering big savings on a 360 bundle on eBay. 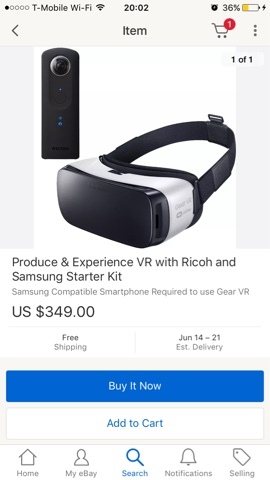 Called the “Produce and Experience VR” bundle, it includes both a Ricoh Theta S and a Samsung Gear VR headset and is selling for $350. Normally, the Theta S is $350 by itself and the Gear VR headset is normally $99. So, it’s like getting the Samsung Gear VR headset for free! Please note the Gear VR is compatible only with the latest flagship Samsung phones (S6 and above). However, if you don’t have a compatible phone, you could sell the Gear VR and effectively get a big discount on the Ricoh Theta S.